Becoming a truck driver is a great way to start making great money fast with minimal training and educational requirements. But did you know that truck driver salaries vary quite a bit across the country? If you have the opportunity to relocate, it makes sense to become a truck driver in a state where it is going to pay you more. We have gone ahead and pulled the most recent data from the US Bureau of Labor Statistics (BLS) to find out which states pay truck drivers the most and least in terms of hourly wages and annual pay. The data is current as of May 2016. *We went ahead and included 11 items in this list since D.C. is not a state, but a district. You earn even less as a truck driver working in Guam or Puerto Rico, where the salaries are $13.92 an hour and $9.36 an hour respectively. The US Virgin Islands also does not pay very well—just $16.58 an hour. 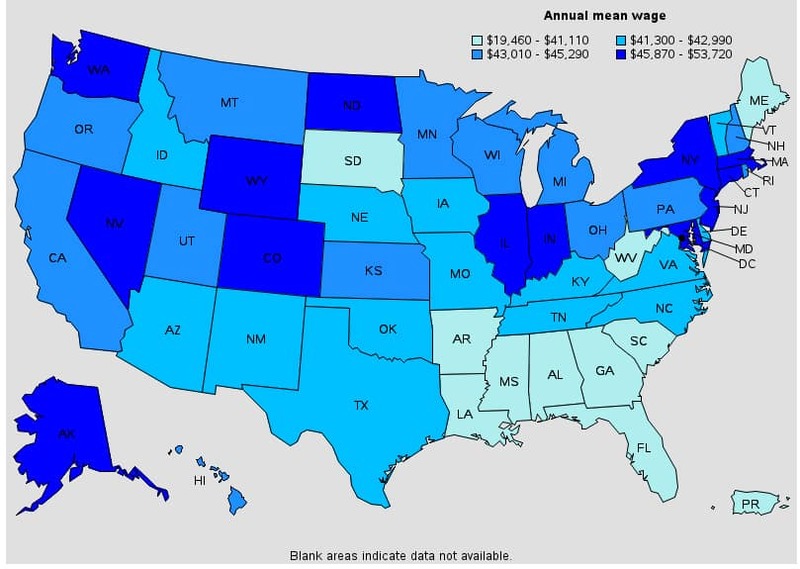 As you can see, most of the states with lower wages are located in the southeast part of the country (South Carolina, George, Mississippi, Louisiana, and so on). Most of the opportunities to make higher salaries are found in the northeast or in the western United States. There are a few surprises, however. For example, it seems unusual that North Dakota is the highest-paying state for truck drivers as of May 2016, but South Dakota is ranked as the 5th lowest state for truck driver wages. The two states are located right next to each other after all, and there is quite a significant gap between $53,720 and $40,090. Ready to check out the full list? Take a look at the chart below. Want to learn more about these numbers and what they mean? Be sure to scroll down past the chart for more detailed information. As mentioned before, this data comes from the BLS. To be more specific, it comes from the Occupational Employment Statistics. Each of the numbers we have given in this table is a mean average. You calculate a mean average by adding up all of the truck driver salaries in a state and then dividing by the number of data points. But Wait … What About Cost of Living? Does this mean that you should drop everything and move to New York or the District of Columbia? Who wouldn’t rather make one of the top truck driver salaries in the country than continue pulling in a low wage in some state in the southeast? Actually, you may not want to relocate at all. Think for a moment about the states which made the list of the top 10 highest truck driver salaries. New York, Connecticut, Alaska … a lot of these are very expensive places to live. Likewise, many of the states which made the list for the lowest truck driver salaries are relatively inexpensive when it comes to rent, utilities, groceries and so forth. So you save money by living in those states. This article by U.S. News and World Report ranks affordability for housing and the general cost of living for all 50 US states. Certain states like New York and Alaska come in as really not affordable. Alaska ranks 46th and New York ranks 48th. That is why truck drivers in those states are earning more money. Their salaries were adjusted so that they would be more likely to afford to live in those states. Meanwhile, some other states like West Virginia and Mississippi rank as quite affordable—10th and 13th respectively. That is one of the reasons why truck drivers in these states tend to earn less. They are also spending less to get by each month. One interesting state to consider is North Dakota. This state is ranked as the 20th most affordable one to live in, yet it pays the highest truck driver salary. Because it is not one of the most expensive states to live in and it does pay so well, after adjusting for cost of living, it comes out as one of your best overall options. If you live here, your expenses should not be too bad, and your salary will be high. This should give you some extra income compared to what you would be socking away elsewhere. Illinois is another good example. It is only marginally more expensive to live in than North Dakota, but is also one of the 10 highest paying states. Remember to think about different regions within a state as well. In some states like South Dakota or Nevada for example, you can encounter striking differences in cost of living from one area to the next. This is largely due to the presence of significant tourist attractions. Of course, that means your salary could also vary widely depending on the spot you decide to call home. So how can you find the state where you will truly earn the best living as a truck driver? Our recommendation is to go ahead and start with this data, and cross-reference it with the cost of living data we linked. But go deeper with your research after that. Investigate different cities. Look for a place where you can maximize your income while minimizing your costs. That is where you should be able to earn the highest profits after you account for your expenses. And remember, if it doesn’t work out, you can always relocate—truck driving is a high-demand profession across the US!